Miter saws are available from various local, national and international companies. They differ in the features, material,and cost. With the wide options and varieties available, one may find it difficult to decide which one to select. Based on their requirements and the type of work they can make a shortlistof the required Miter saw and then based on the mitre saw reviews one can choose the best available product. Miter saws are of different kinds and they work differently. Here are a few varieties of the miter saw and how they work. A standard Miter saw: This works to make straight cuts. They can generally make cuts of 90 degrees and 45 degrees. This is mainly used in framing. The compound miter saw: These are designed with blades which can pivot both left and right. They are specially designed for bevel cutting. They can control the saw on both the axes at a time to make compound cuts. They generally suit working on picture frames or crown molding. Dual compound Miter saw: They are like compound miter saw but the difference is that in contrast to the regular compound Miter saw, dual compound Miter saw can tilt in both directions. They can tilt both to left and right and can make bevels at any angle easily. Sliding Compound Miter saw: This of very helpful to work on long work boards. They work just like the compound Miter saws, but the difference is that the blades on the miter saw can be moved forward and backward making it easy to work on a long work board. Laser Miter saw: This has a laser projector attached on to the miter saw which actually shows the exact path in which the cut will be made. This is done by illuminating the work board with the help of LED. 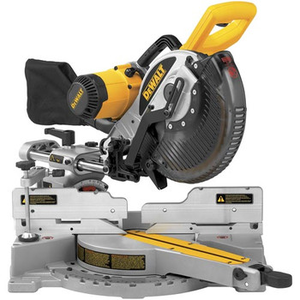 Points to consider before choosing a miter saw. Check for the safety features: While choosing a Miter saw check for availability of safety features like a blade guard which covers the blade tooth, a safety clamp which helps to keep the workpiece in exact position, a dust bag that can collect all the dust and keeps the workers away from harm and the electric brakes which actually stops the spinning blade within two seconds. The Angle crowns and angle markings: Look for the tall fence which can support angle crowns well and also make sure that angle markings are easy to read. Keeping all the above-mentioned features in mind one can look for a suitable miter saw that matches both his requirements and needs. But make sure you collect all details about the working capacity and durability of the device before finalizing your choice. You can always do this by checking the reviews of customers who are already using it.